Dr. Tham serves patients from ages 1 to 100+ in the Surrey/North Delta area at his North Delta Dental Office. He graduated from the UBC Faculty of Dentistry, and has been in practice for over 15 years, having worked in a number of offices throughout the Lower Mainland. He was a former instructor at the UBC Faculty of Dentistry, and is also currently a trained Professional Coactive Coach.He particularly enjoys working with children and families and takes great pride in watching them grow up with optimal dental health. 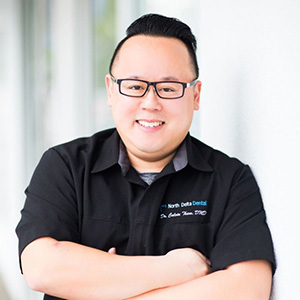 Dr. Tham maintains a blog, Facebook page and YouTube channel to help educate families and to show people that visiting the dentist can be fun and enjoyable!In his spare time, he enjoys spending time with his young family, cooking, and cheering on his Vancouver Canucks.